Classic looking every day watch. 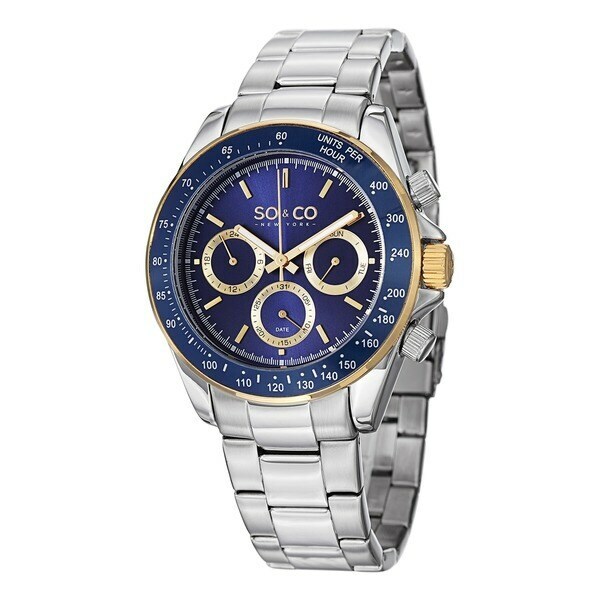 Finish your look when you slip on this attractive SO&CO New York Monticello bracelet watch. Featuring a silvertone strap and a black dial, this elegant watch also features the calendar date, helping you to stay on schedule. Was suprised at the weight and the quality of this watch. At this price I expected a lot less. I took it to the jeweler and had it sized to my wrist and I love it. This is a great looking watch with a big enough face to easily see all the dials and the bracelet is beautiful and sturdy with a double clasp so it opens only when you want it to. The watch is keeping perfect time and is comfortable to wear and I would suggest it for others to buy. My husband needed an "everyday" watch (he has a beautiful Rolex however he doesn't wear it traveling or on a daily basis) and the quality & craftsmanship on the SO&CO was amazing!! He absolutely loves it!! Bought this for my son for Christmas. Very nice watch! Has an expensive look without the expensive price! Very well made with high end materials. I bought this for my husband. He LOVES it!! you cant go wrong with this watch! perfect price and perfect for all occasions. Thank you!!! Fantastic watch, a great value and keeps great time. Very nice and stylish...battery went very soon after purchase. I bought this for my husband and he really likes it. The weight is good and it feels substantial. We're both satisfied with this purchase. "Yes, I had four links taken out. Its looks great and fits perfect. I'm going to buy another one just like it." "Can u take off links to fit a smaller wrist ." Good looking watch and not a bad price. I am not familiar with the SO&CO brand and thought I'd give it a try.